Students’ creative ideas for how to prepare, stay safe, and rebuild following natural disasters became award-winning inventions at the fourth annual FIRST LEGO League Global Innovation Award ceremony, held at the U.S. Patent and Trademark Office in Alexandria, VA. Dean Kamen, inventor and founder of FIRST, a not-for-profit organization created to inspire young people’s participation and interest in science and technology, honored the winners. 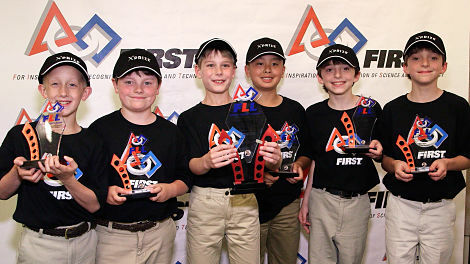 More than 500 FIRST LEGO League teams across the globe submitted their inventions. A panel of expert judges reviewed the submissions, narrowed the list to three finalists, and then selected a winning team and two runner-up teams. The winning team received a cash award of $20,000 and the two runner-up teams each received $5,000. The winner was the Balloon-Based Notification Sign, created by The Brain Busters of Sherborn, MA (pictured). The sign indicates where to find aid after a natural disaster, when traditional infrastructure is not available. A large sign is suspended from a helium balloon that can be seen from very long distances and deployed in high winds, snowstorms and extreme cold.